We’ve been focusing on healthier eating for the last few weeks at our house. From the results of our little Facebook poll last week, it sounds like many of you have, too! 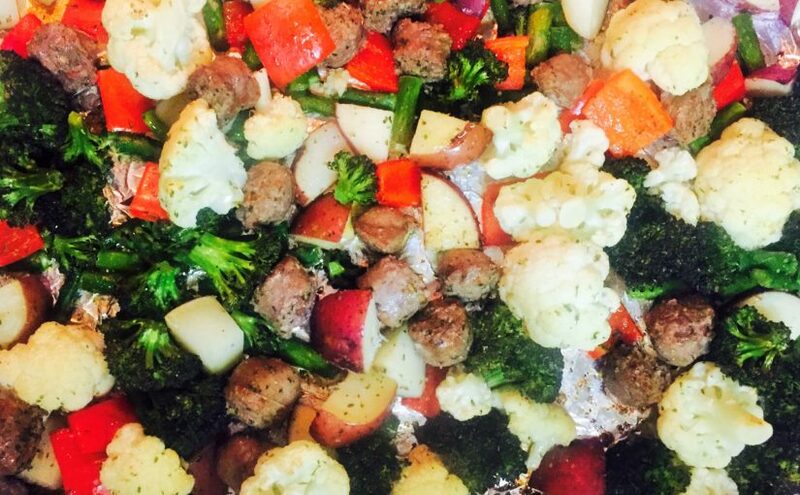 Our Quick and Healthy option- Sheet Pan Sausage and Veggies, was the recipe you wanted to try most. So here we are! I don’t know about you, but I’ve found that sticking to a healthy menu takes a certain amount of planning. If each night is planned out ahead of time, ingredients already on hand… it makes it SO much easier to stick to your guns and have delicious roasted veggies instead of giving in and getting take out. This is such an easy weeknight meal, and it can be easily adapted based on your family’s preferences. My veggies of choice are broccoli, cauliflower, bell peppers, and green beans. 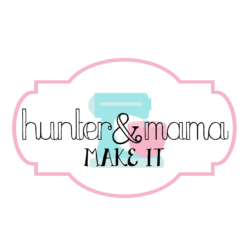 Honestly, that’s based largely on what Hunter eats… and what I had ready to go in the produce drawer when I was making this one! But if your crew prefers carrots to bell peppers, or you decide to add onions and mushrooms just for fun, I’m totally confident that you’ll love it just as much! We also use a couple of red potatoes, but if you’re going super low carb, you could leave those out. The most time consuming part of this dinner is chopping all of your veggies. To make the post-work day prep go a little quicker, I often chop my veggies ahead of time and store them in the fridge until I’m ready to preheat the oven. Having all bite-sized pieces ensures that everything cooks evenly in the oven. I arrange the veggies on a large LINED sheet pan. Don’t forget to line the sheet pan! One of the best qualities of a weeknight meal is easy cleanup. One pan and no scrubbing = one happy Mama! Next, I cut up my sausage into bite-sized pieces. 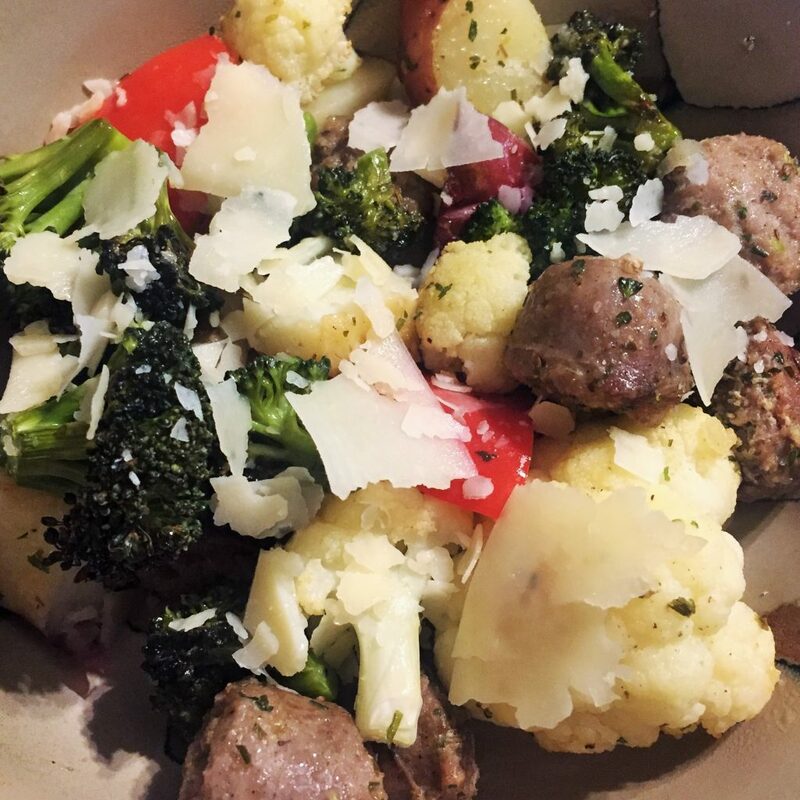 One of my husband’s coworkers makes his own Italian sausage… we’ve been using some of his homemade sausage in this recipe and it is so good! If you’re not lucky enough to know someone who’s into sausage-making, use your favorite sausage from the store. We like Italian for the extra kick it gives, but you could also use a smoked turkey sausage or something else to make it work for your family! Add the sausage to the pan with the veggies, and drizzle olive oil over everything. Then add 2 teaspoons dried oregano, 1 teaspoon dried parsley, 1 1/2 teaspoons garlic powder, salt and pepper to taste. Toss everything together until evenly coated. Bake in a 400 degree oven for 15 minutes, then stir and bake for another 10 minutes or until all the veggies are tender. Sprinkle a little Parmesan cheese on top to finish the whole thing, and enjoy! Cut all of the vegetables and sausage into bite-sized pieces and spread out in a single layer on a large, foil-lined sheet pan. Drizzle olive oil over the whole pan. Add oregano, parsley, garlic powder, salt and pepper. Toss until evenly coated. Bake in a 400 degree oven for 25-30 minutes, stirring half way through. Remove from oven and top with parmesan cheese if desired. P.S. For all of you that voted for my margarita recipe last week…. DON’T WORRY! It’s coming very soon! Sounds delicious, excited to try! Thanks. The meal was one of my husbands favorite.